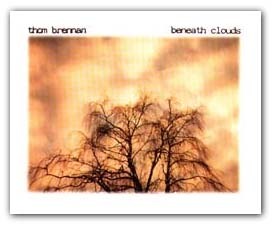 The Arya label, a division of Amplexus (the Italian label known for its ltd edition 3" CD releases and unique packaging) has recently released Beneath Clouds, the new CD by Thom Brennan. Beneath Clouds is Brennan's second full- length CD release and his first since the 1987 self-released cassette Mountains. Beneath Clouds comes beautifully packaged, which is typical of all Amplexus/Arya releases, and contains two lengthy tracks (Pt.1: 31 minutes & Pt.2: 41 minutes) which blend seemlessly and should be considered one long musical journey. Both Parts take quite a while to evolve. They are not compositions made of several separate ideas linked by spacey interludes, but rather (as with much of Brennan's work) they are one idea that opens, evolves, and folds back in on itself over time. Part One is the more perceivably rhythmic of the two parts, focused by complex, somewhat minimal layers of patterns. It asks us not to follow a beat but to search for the pulse, thereby inviting us inside the composition. The patterns start almost immediately at the onset. Brennan keeps the piece interesting by slowly, almost subliminally, adding and removing patterns from the mix while layering slow, breathy melodies and deep pads above the familiar pulse. The overall experience is organic and earthbound. The beginning of Part Two is spent settling down after the activity of Part One and builds slowly with layers of soft, breathy melody, deep metallic strikes, swirling chimes, buzzes, and finally -- an ever evolving struck metal tone pattern. Above this pattern Brennan's well-placed, floating pitch-bend lead evokes cloudwalking. Part Two lands, after a brief pause, and soon we're following a more aggressive and staggered pattern through the same cloud of synth layers. All the while the deep metallic strikes remind us that we're not far from where we first began. As "Beneath Clouds" fades away, it doesn't really end: we can still hear Brennan and his synths continuing without us in the distance. Brennan's music is evocative of place, that place being "an island of the East China Sea" where he spent his youth. It's clear that Thom's music is (at least in part) expressing an attachment to this tropical region from his past. Although Brennan has been making music since 1980, we've not really seen much in the way of completed solo recordings. Recently there has been The Path Not Taken (the Amplexus 3" from '95), the reissue of the 1987 Mountains cassette on Rubicon (in 1993, with the newer bonus track "Monsoon"), and collaborative efforts with Steve Roach on "In The Heat of Venus" and "New Moon at Forbidden Mesa" from the anthology Western Spaces ('87). As with many artists in his field, Brennan faces an obstacle in the path of realizing his art: music is his avocation, not vocation. In other words, there's really no money in the kind of esoteric music these artists are making. Therefore, most must have a "day gig" to get by. I have tremendous respect for those who possess the will to be heard and to get their music out through independent CD releases. People such as Thom Brennan do not create music because it's their job, they do it because it's their calling. It's in their blood and under their skin. Simply, it's what they _must_ do.